Christina Fox received her Master’s Degree in Counseling from Palm Beach Atlantic University. 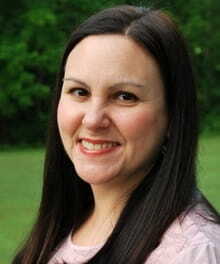 She writes for a number of Christian ministries and publications including Desiring God and The Gospel Coalition. She is the author of A Heart Set Free: A Journey Through the Psalms of Lament and Closer Than a Sister: How Union with Christ helps Friendships to Flourish. You can find her at www.christinafox.com, @christinarfox and www.Facebook.com/ChristinaFoxAuthor. In my quiet time lately, I've been reading the book of Jeremiah. He was a prophet to the people of Judah, called to warn them of God's coming wrath for their sin. As I've read it, I've found myself wanting to do what my kids do while watching a game on TV: yell at the players, telling them what they should be doing. "Thus says the LORD, the God of hosts, the God of Israel: If you will surrender to the officials of the king of Babylon, then your life shall be spared, and this city shall not be burned with fire, and you and your house shall live. But if you do not surrender to the officials of the king of Babylon, then this city shall be given into the hand of the Chaldeans, and they shall burn it with fire, and you shall not escape from their hand” (Jeremiah 38:17-18). As I read this, I thought to myself, "The king had a prophet of God speaking to him and he still did what he wanted to do. How can that be?" But then I remember, wait, I have God's words too, right there in my Bible, and still I turn and do my own thing. I've had the same thoughts whenever I read the account of the Israelite's leaving Egypt and wandering in the desert. I think, "How could they not believe God would be with them? They saw his power in the plagues, they saw him part the sea and defeat their enemies, and then they question whether he will give them water to drink or food to eat?" But then I do the same thing. I read God's word and still wonder what he wants me to do with my life. I've seen God's faithfulness in my life over and over and still I question whether he will provide. I see his grace and mercy poured out for me at the cross and still I question whether he loves me. I'm no different than God's people in the Old Testament. The Apostle Paul wrote to the church at Corinth, recounting some of Israel's history. He wrote of their idolatry, their grumbling and complaining, and their immorality. He wrote, "Now these things happened to them as an example, but they were written down for our instruction, on whom the end of the ages has come" (1 Corinthians 10:11). The Corinthians were resting and relying on their progress in faith and thought they had made it. They had spiritual pride. As a result, they had slipped into sin of their own (idolatry and immorality, among other things). Paul pointed to Israel as an example, reminding them that Israel had the same spiritual benefits as the Corinthians did, yet they fell into sin (1 Corinthians 10:1-5). That's why he wrote, "Therefore let anyone who thinks that he stands take heed lest he fall" (v. 12). This is a strong reminder for me in my own spiritual pride. When I read the stories of my ancestor's in the faith, instead of shaking my head in wonder at their actions, I ought to see myself in them. The stories are examples for me to realize I have the same benefits as those in the past did (God's word, the community of faith, the sacraments, etc), yet I am just as prone to idolatry. I am just as prone to do my own thing. And I need a Savior just as much as they did. It's easy to study the narratives of the Old Testament and merely read them as history lessons. And there's certainly history there to learn. But ultimately, those stories remind me of my story. They point to the depths of my depravity and my great need for Jesus. They remind me not to trust in my heritage, in what I have learned, in my spiritual disciplines, or in what I have or have not done. Rather, they remind me to trust in Jesus. He is the only one who can rescue me from myself. He is the only one who can help me resist temptation to sin (1 Corinthians 10:13). He is the author and perfecter of my faith. What about you? Have you learned from the example of those before us?